This web site contains information related to research activities performed in Benaglia group! This web site contains information related to research being carried out in our laboratories, the former and current group members, the coworkers, news and positions available, and also a link for the students interested in joining the group for master or PhD thesis. If you like what we are doing, please contact us! We are always happy to host academic and industry visitors and you are invited to get in touch. Technotrain is a new project coordinated by Prof. Maurizio Benaglia and supported by European Union as a part of the Marie Sklodowska-Curie innovative training network (ITN). Aim of Technotrain is the training of a group of young European chemists, through a doctorate program, that can merge the needs of modern industrial applications with an accurate academic expertise. 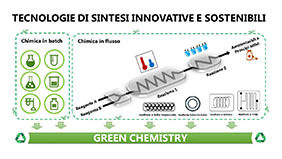 In the context of Technotrain, the Benaglia group, in collaboration with a German "high tech" company and with three other European research centers, will develop innovative and sustainable methods for the synthesis of chiral amino acids (in particular non-natural) and of other active ingredients of pharmaceutical interest applicable to industrial scale. The combination of enabling technologies with low environmental impact, such as the use of a 3D printing approach for the realization of new devices, and other modern strategies such as photocatalysis, continuous flow processes, metal-free catalysis, represents a fundamental step towards the development of a more efficient green chemistry. We are a very dynamic group interested in all aspects of stereoselective synthesis. All the publications from the Benaglia group in all our areas of interest. See the current members of the group!